Today, my girlfrient sent me to the Swedish furniture supermarket to get some of these shelves for our house, because they're a special offer for a few days. But, of course, to be able to try how exactly they'll fit into our new home, I had to make 3D-models to use in SweetHome3D. 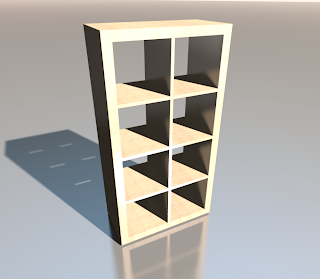 So I started FreeCad and got designing. 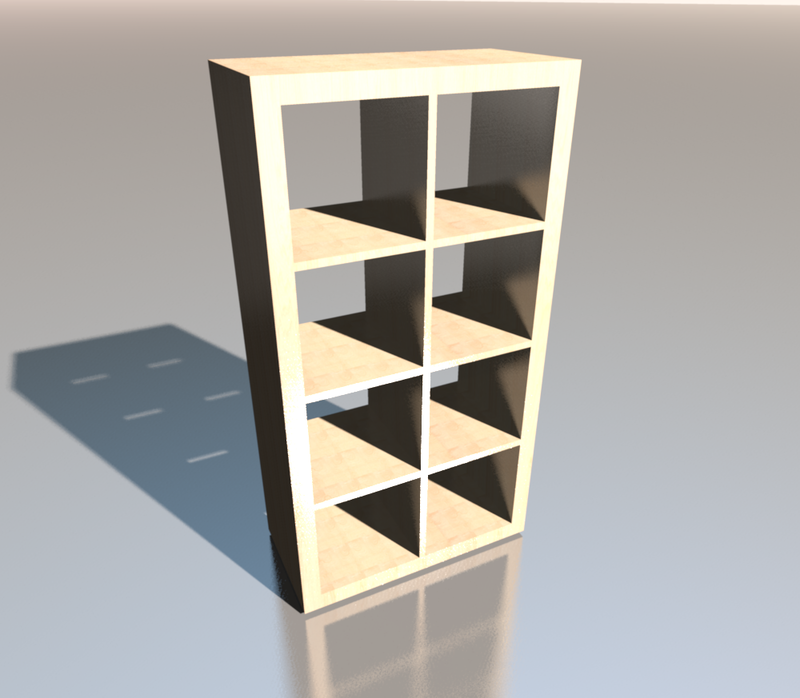 Above, you can see the result: a 2x4 rack bookshelf in white and with a birch wood texture, which are the two designs we'll be using. Look for EXPEDIT, if you want the real stuff. You can probably already imagine, that it wasn't a big deal to make these, since they are box shapes all over. First, I needed to find out, how thick the side walls are and how thick the inner shelves are. The overall dimensions are available from the Swed's website. With some educated guessing, I soon got the correct thicknesses and was ready to go. 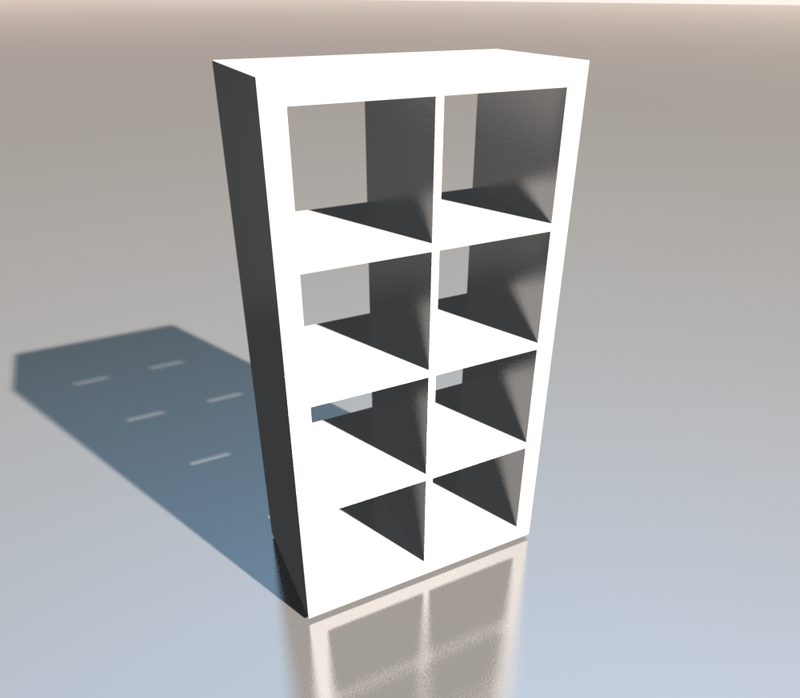 In FreeCad's part view, I created a box with the original dimensions, 149x79x39cm, by the way. Then, I created another box, which is exactly as big as one of the eight racks: 33x33x39cm. I set the position according to the thicknesses of the outer and inner walls. The same was applied to copies of the box until I had 8 of them, all at the right places (where the racks have to be, that is). 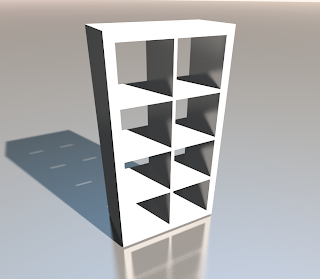 Afterwards, to make my like a bit easier, I selected all 8 boxes and merged them to a single object. Note, that this works, even though the boxes to not intersect! As a last step, I cut the 8-box-shape from the big outer shape and it was done. 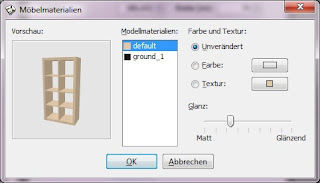 The good thing about this editor is, that one can set the brilliance of the material with a slider, instead of just choosing between glossy or matte. So, I chose the birch wood texture, set the brilliance to a reasonable value by experiment and the exported the whole thing as .obj again from SweetHome3D to create a clean .mtl. The same procedure was for the white one, but of course there's no texture, but simply the color set to white. Feel free to download the files for use with SweetHome3D, or any other program that supports .obj, here.